We’re turning the meeting room into a coding lab for kids and teens. Ages 7 to 17, ages 12 and younger with adult. 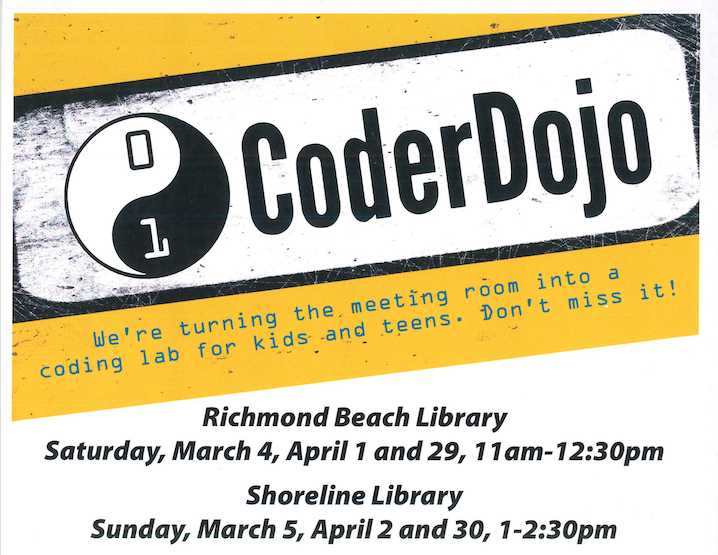 CoderDojo is a free, volunteer run program. Explore coding in an open, collaborative environment for youth. Join the group anytime for self-directed online learning. No experience necessary. Bring your charged laptop or tablet (a limited number of devices will be available for checkout during the program for those who don’t have access to a laptop or tablet). This is a drop-in program. Registration not required. Questions? Contact Leslie Carter, Youth Librarian, lacarter@kcls.org. Reasonable accommodation for individuals with disabilities is available; contact the library prior to the event if you require accommodation.